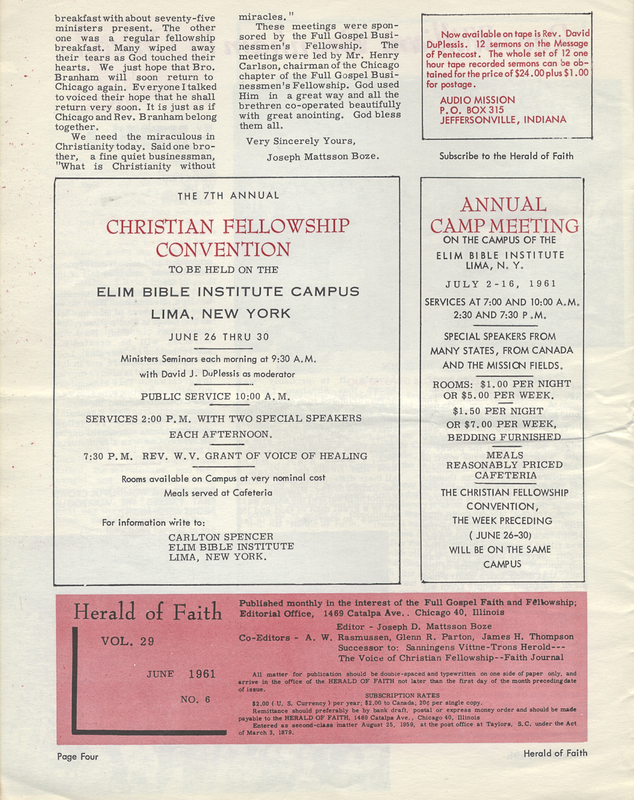 The following article was published in the Herald of Faith magazine, June 1961. Chicago has again been honored by a visit of God's servant, Rev. William Branham. The meetings were wonderful, loaded with the power and glory of God. Rev. Branham's ministry was greater than ever and themes-sages were full of the power of God with much of the word of God from the old testament scriptures very seldom thought of. There is no doubt that these messages are by direct inspiration of the Holy Spirit. 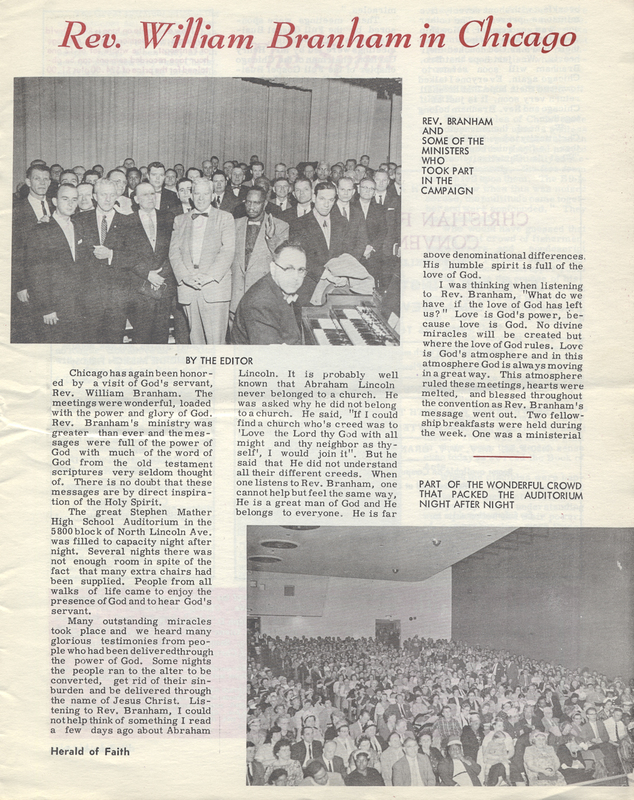 The great Stephen Mather High School Auditorium in the 5800 block of North Lincoln Ave. was filled to capacity night after night. Several nights there was not enough room in spite of the fact that many extra chairs had been supplied. People from all walks of life came to enjoy the presence of God and to hear God's servant. Many outstanding miracles took place and we heard many glorious testimonies from people who had been delivered through the power of God. Some nights the people ran to the altar to be converted, get rid of their sin-burden and be delivered through the name of Jesus Christ. Listening to Rev. Branham, I could not help think of something I read a few days ago about Abraham Lincoln. It is probably well known that Abraham Lincoln never belonged to a church. He was asked why he did not belong to a church. He said, "If I could find a church whose creed was to 'Love the Lord thy God with all thy might and thy neighbor as thyself', I would join it." But he said that He did not understand all their different creeds. When one listens to Rev. Branham, one cannot help but feel the same way, He is a great man of God and He belongs to everyone. He is far above denominational differences. His humble spirit is full of the love of God. I was thinking when listening to Rev. Branham, "What do we have if the love of God has left us?" Love is God's power, because love is God. No divine miracles will be created but where the love of God rules. Love is God's atmosphere and, in this atmosphere, God is always moving in a great way. This atmosphere ruled these meetings, hearts were melted, and blessed throughout the convention as Rev. Branham's message went out. Two fellowship breakfasts were held during the week. One was a ministerial breakfast with about seventy-five ministers present. The other one was a regular fellowship breakfast. Many wiped away their tears as God touched their hearts. We just hope that Bro. Branham will soon return to Chicago again. Everyone I talked to voiced their hope that he shall return very soon. It is just as if Chicago and Rev. Branham belong together. We need the miraculous in Christianity today. Said one brother, a fine quiet businessman, “What is Christianity without miracles.” These meetings were led by Mr. Henry Carlson, chairman of the Chicago chapter of the Full Gospel Businessman’s Fellowship. God used him in a great way and all the brethren co-operated beautifully with great anointing. God bless them all.